Portraits have been an important part of the American presidency since Senator William Bingham commissioned the 1796 painting of George Washington that would later serve as a model for the image of Washington on the one dollar bill. The tradition has persisted through the last 200 years, but has faded into the background as a symbolic, yet boring, gesture. However, this year, the portraits of a President and a First Lady have made headlines and received both acclaim and criticism. Surprisingly, this is not the first time presidential portraits have made headlines in the last year and a half. President Trump sparked controversy with his choice of portrait to display in the Oval Office. In a time of anxiety and uncertainty in American politics, the symbolism of presidential portraits has provided both hope and unease for the American people. Usually, presidential portraits hang in the National Gallery. However, when a new President takes office, they choose a selection of portraits to hang in the Oval Office. These are usually portraits of past Presidents they find particularly inspiring. In the beginning of his term, Donald Trump notably selected the portrait of Andrew Jackson. This decision sparked controversy because Jackson was a slave-owner, a racist, and signed the Indian Removal Act which resulted in the “Trail of Tears.” Trump has previously spoken of his admiration for Jackson, calling him “an amazing figure in American history.” There are indeed many parallels between Trump and Jackson. Jackson was a populist who gained political victory by appealing to the common man; he was the underdog that Trump has made himself out to be. Trump’s decision to hang Andrew Jackson’s portrait in the Oval Office is a political appeal to these similarities. However, it also brings to mind some of the darker parallels between the two presidents, such as Trump’s own history of racially charged remarks. For instance, on his campaign Trump characterized Mexican immigrants as “racists” and more recently described Haiti and African nations as “shithole countries.” The symbolism of Jackson’s portrait did not go unnoticed, particularly when it served as a backdrop to a ceremony honoring three Navajo code talkers. While the White House denied any intentional symbolism in the placement of the portrait, Native American groups and activists were puzzled and dismayed by the portrait’s prominence in the background of the ceremony. “We noticed,” said Jacqueline Pata, executive director of the National Congress of American Indians. The portrait created an uneasy parallel between Trump and Jackson and undermined the efforts of the ceremony to honor member of the Navajo tribe. On February 12th, Barack and Michelle Obama unveiled portraits of themselves at the Smithsonian National Gallery in a ceremony attended by former Vice President Joe Biden and many other influential figures in politics and Hollywood. The country’s response to the portraits was loud and varied; whether they liked them or hated them, everyone had something to say about the Obama portraits. 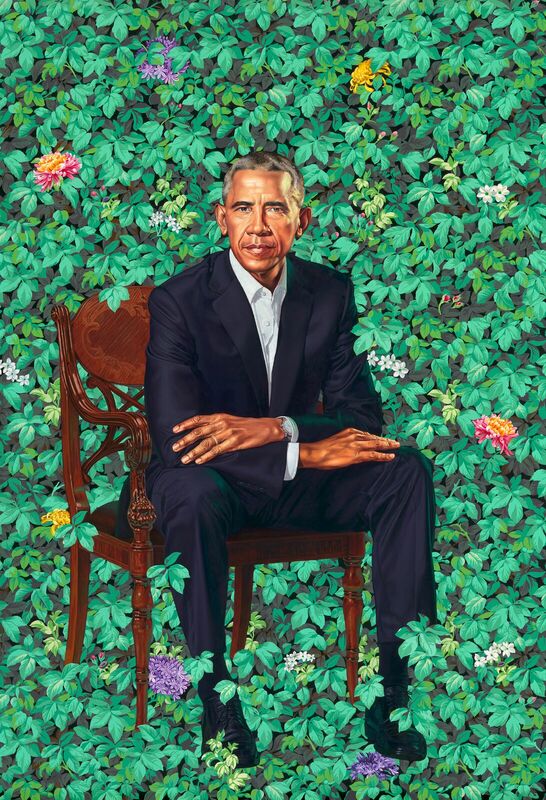 Barack Obama by Kehinde Wiley, oil on canvas, 2018. National Portrait Gallery, Smithsonian Institute. Photo via the Smithsonian Instituion. 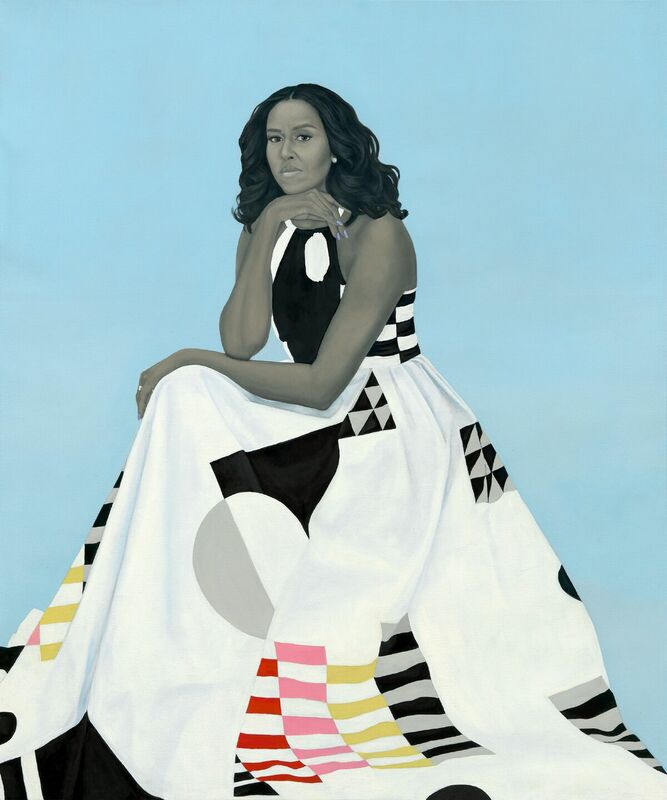 Michelle LaVaughn Robinson Obama by Amy Sherald, oil on linen, National Portrait Gallery, Smithsonian Institution. Photo via Smithsonian Institution. The portraits created such a response both because they are visually bold and modern, and because they are an unabashedly political symbol. Both the portraits themselves and the artists that painted them were a political statement. Both artists are African American with bodies of work dealing heavily with race and identity in the United States. While this is not the first presidential portrait painted by an African American artist, it is the first that will hang in the National Gallery and the symbol created by a black president being painted by a black artist is uniquely resonant. 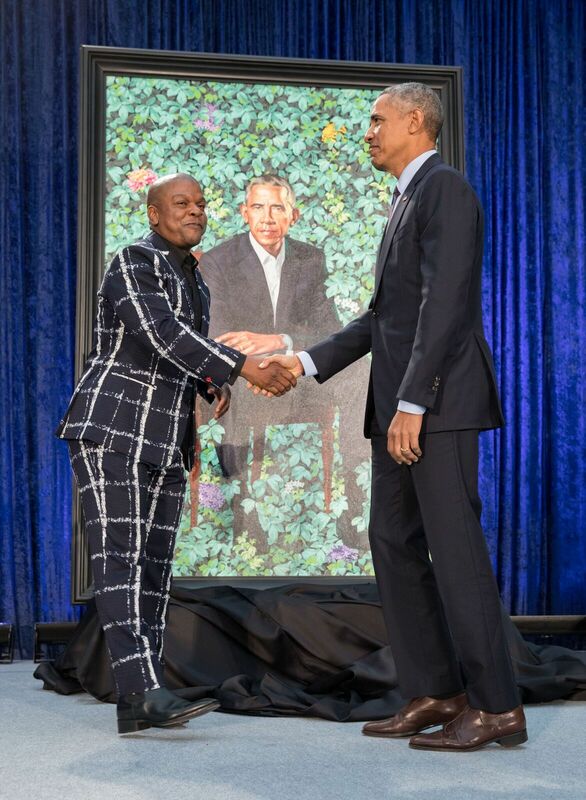 Obama’s portrait was painted by Kehinde Wiley, a New York-based African American artist known for his subversive portraits. While choosing a black artist is not inherently a political statement, choosing Wiley certainly is. 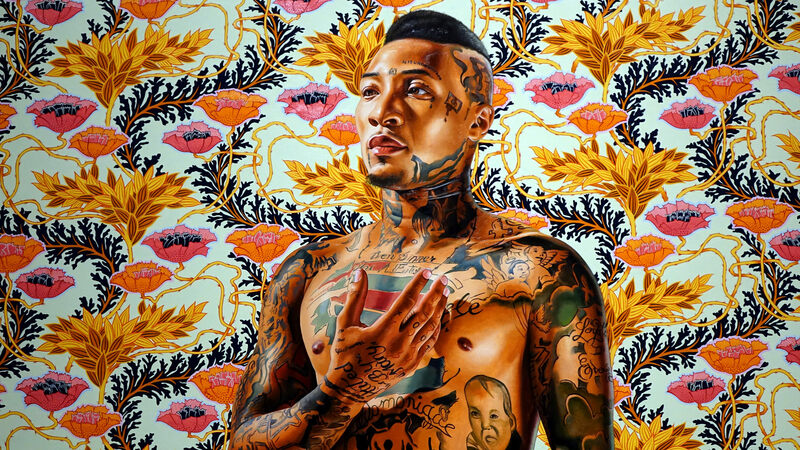 Wiley’s style of portraiture takes canonical works of Western art and replaces the sitter with people whose images are in direct contrast with the structures of power implied in the portrait, often young men on the streets of Harlem. He also replaces the backdrops with graphic and colorful patterns. His works are shiny and popular, but still unusual and contemporary for the style of a presidential portrait. Wiley is also highly aware of the role that portraits played in the power structures that subjugated people of color for hundreds of years. Wiley says that portraiture is “a choice. It’s the ability to position your body in the world for the world to celebrate you on your own terms.” Portraiture is about visibility, and Obama is a president for whom visibility has always been inherently political because of his race. It seems fitting that after a career of painting people of color in the place of people of power, Wiley should paint Obama, both a person of color and once the most powerful man in the world. Obama’s portrait fits into Wiley’s style. Obama almost floats, seated, in front of a bright wall of plants – but his pose is his own. The flowers are symbolic of Obama’s life, with lilies representing Kenya, Chrysanthemums Chicago, and Pikake Hawaii. Wiley wants to challenge viewers to consider Obama’s beginnings and his journey. The pose holds a political message in itself. Obama has described Wiley’s first impulse to elevate him and put him on horseback, quipping “I had to explain, ‘I’ve got enough political problems without you making me look like Napoleon.’” Instead, Obama’s pose follows in a long tradition of seated presidential portraits, avoiding the symbols of power used by royalty and instead showing themselves as men of the people, accessible and open. Kehinde Wiley shakes hands with Barack Obama at the unveiling event. Photo by Pete Souza, via Concetta Duncan of the Smithsonian Institution. Barack Obama’s portrait has received such a wide response partly because it has such a different aesthetic than previous presidential portraits. However, it also serves as a reminder of the deeply political nature of portraits as grounded in the symbolism within the portrait and in the artist. It stands in stark contrast to previous portraits, yet follows in their tradition, just as Obama was both new and traditional as a president. The fact that the Obama portraits received the response they did – both the positive and the negative – is revealing of the deep effect that art can have on a public when it is both visually dynamic and political. In today’s era, there is an ostensible disconnect between art and politics. However, as Trump’s use of the Jackson portrait and Obama’s new portrait make evident, art still possesses the ability to represent the political and demonstrate how those in power wish to be seen. Special thanks to Concetta Duncan of the Smithsonian Institution for providing MJPS with photos of the Obama portraits. Feature Image: painting by Kehinde Wiley, courtesy of the Smithsonian Institution. The National Portrait Gallery is grateful to the following lead donors for their support of the Obama portraits: Kate Capshaw and Steven Spielberg; Judith Kern and Kent Whealy; Tommie L. Pegues and Donald A. Capoccia. The National Portrait Gallery is grateful to the following lead donors for their support of the Obama portraits: Kate Capshaw and Steven Spielberg; Judith Kern and Kent Whealy; Tommie L. Pegues and Donald A, Capoccia.